The building on 43 Hanevi’im Street is a unique architectural creation. Each apartment is being constructed with the highest quality materials and finished to the highest standards. The distinctiveness of Bayit Banevi’im lies in its intimate atmosphere, engendering a community spirit and a feeling of belonging. HaNevi’im Street is one of most sought after in the Jerusalem real estate market, and Bayit BaNevi’im is a small intimate property of 9 luxury private residences and a 30 room boutique hotel. Rehov Hanevi’im is one of the most renowned streets in Jerusalem. This picturesque and serene thoroughfare runs from Davidka Square near the Machane Yehuda market, right up to the walls of the Old City at the Damascus Gate. Bayit Banevi’im is situated in the very heart of Jerusalem. The Old City, the Western Wall and religious neighborhoods are less than a 15 minute walk away. Hanevi’im Street is adjacent to Jaffa Street – now part of the Jerusalem light rail system, making the entire city accessible from your doorstep. Every apartment is designed with the highest of standards including custom kitchens, marble or porcelin granite floors, dropped ceilings, cove lighting and sconces, spacious succah balconies, and more. Long term rentals are being rented unfurnished with parking and storage. Short term rentals are fully furnished with fully stocked (kosher) kitchenware, bedding, towels, internet / wifi and cable TV. The lobby has been designed to create an inviting and welcoming atmosphere for all. Every floor at Bayit Banevi’im has a communal or public room which, while serving as the required shelters, can be used for a variety of purposes such as a shul, fitness room, game room, communal library and reading room, wine cellar, music room, etc. On the ground floor will be a boutique hotel comprising of approximately 30 rooms. The hotel will also be at the disposal of the residents – for family or friends to stay for Shabbat or Yomim Tovim. There will be a coffee shop, management and concierge services – all available to the residents as well as the hotel guests. 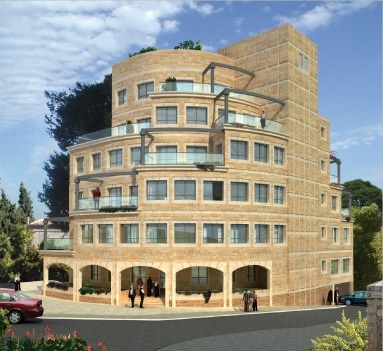 This entry was posted in * For Sale, City Center, Geula, Nachlaot and tagged 3 bedrooms, 4 bedrooms, 4 rooms, 5 bedrooms, 5 rooms, 6 room, apartments, Bayit BaNeviim, City Center, For Sale, Geula, HaNeviim, Israel, jerusalem, luxury apartments, Nachlaot, Real Estate by Francine Chana Bork. Bookmark the permalink.